View and hear a short sample. The Nine Questions Collective casts a spell upon the theater, opening a portal to the dreamland, weaving an epic in sound, video, shadows and movement. 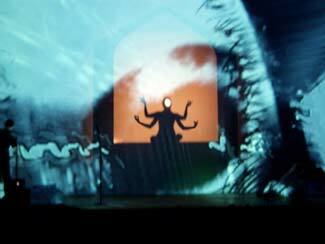 A live video mix projected on dancers and the screen, human-scale shadow puppets, and music generated both by computer and percussive instruments blend into an ever-shifting, fluid composition. Nine Questions has an entirely unique aesthetic vocabulary, influenced by Taoism; Anarchism; Theoretical Physics; contemporary issues in art, music, and society; and more. Every sense is engaged and lead on a narrative trek; the touch of Nine Questions is inimitable. Nine Questions Collective founder Jason Jay Stevens composes and performs music on laptop and junk percussion and leads an ensemble of percussionists. VJ Future Worker Girl, a.k.a. Leslie Raymond, weaves projected images, mixing multichannel video in her unique style. 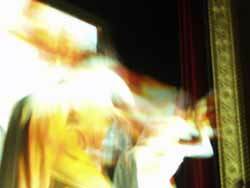 Puppeteer, Naia Venturi and her troupe create a moving spectacle of shadow and light. Stefanie Cohen and Akasha Fluegge perform structured, improvisational movement, in collaboration with a group of Detroit area dancers. The Collective performed 9QV3 at the Michigan Theater, on 14 March 2003, opening the night of screenings for the Ann Arbor Film Festival. 9QV3 is a multimedia composition chronicling a journey of innocence confronted with mortality and ultimately transcending into the truth of non-attachment. 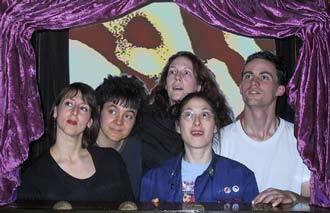 A five-member version of the Collective performed the forty-minute work, 9QV2, at the Immedia03 exhibition of the digital arts at the University of Michigan.